Late last week the world was informed that a film had changed its name. Nothing unusual there, it happens all the time. This one was different. 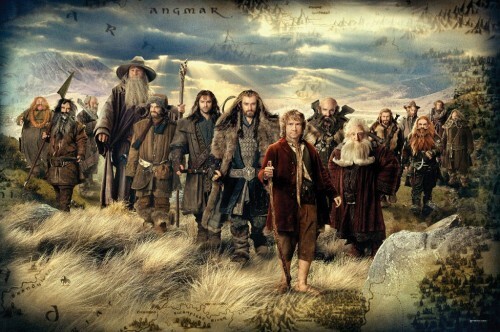 We had been told that the 3rd part of the Hobbit trilogy was going to be called “The Hobbit: There and Back Again“. Not that good a name for the end of a trilogy. If it was going to be a single movie without the padding to make it run to 9 hours from a book that is only about 300 pages long. So, in a way each film is 100 pages of the book. There and Back again was the sub-title of the Hobbit. We have already seen this before in The Lord Of The Rings with an elderly Bilbo putting the finishing touches to his first journey away from Bag End. The first two parts of the trilogy, “The Hobbit: An Unexpected Journey” and “The Hobbit: The Desolation of Smaug“, do describe what’s going to happen in that part. They could have been called “The Hobbit: Going to see a Dragon” and “The Hobbit: Stealing a Dragon’s Gold”. That describes what happens just as well. Peter Jackson was also wondering about the original title for the film and not being correct. I’ll let him talk about why the original name was wrong and why a change was needed. Our journey to make ‘The Hobbit’ Trilogy has been in some ways like Bilbo’s own, with hidden paths revealing their secrets to us as we’ve gone along. ‘There and Back Again’ felt like the right name for the second of a two-film telling of the quest to reclaim Erebor, when Bilbo’s arrival there, and departure, were both contained within the second film. But with three movies, it suddenly felt misplaced—after all, Bilbo has already arrived ‘there’ in the ‘The Desolation of Smaug.’ When we did the premiere trip late last year, I had a quiet conversation with the studio about the idea of revisiting the title. We decided to keep an open mind until a cut of the film was ready to look at. We reached that point last week, and after viewing the movie, we all agreed there is now one title that feels completely appropriate. And so: ‘The Hobbit: The Battle of the Five Armies’ it is. I have also heard that “There and Back Again” could be the name of the Trilogy’s box set when that arrives sometime near the end of 2015. Now that’ll be a great use of the phase that is so associated with Bilbo’s journey in the book.